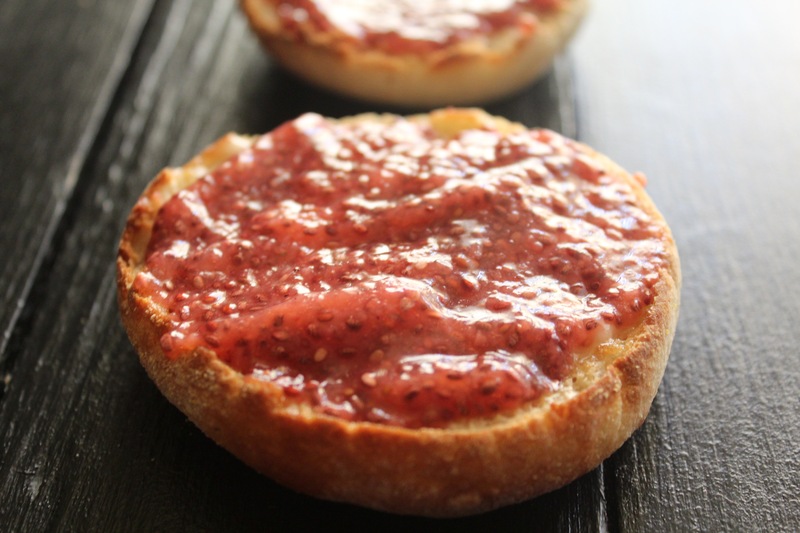 Store bought jam is packed full of sugar and weird stuff, and ain’t nobody got time to can it themselves. 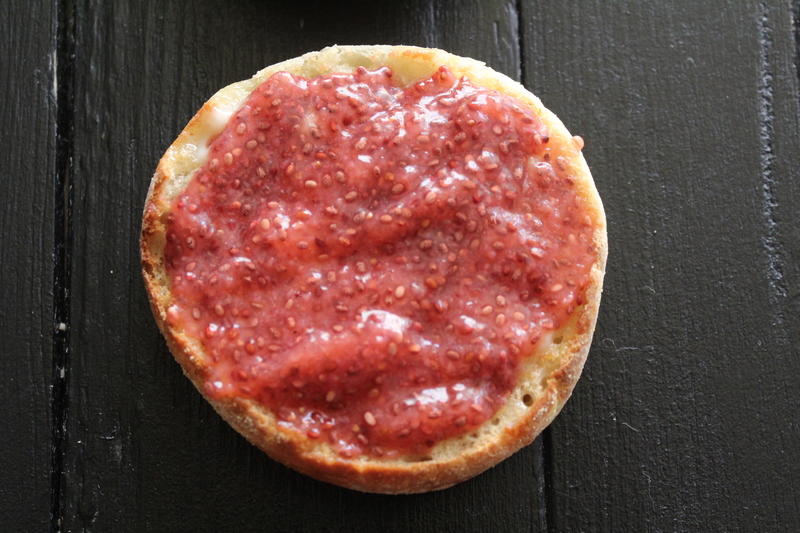 Here we have a super easy, raw strawberry chia seed jam packed full of fiber & protein that can be made in less than 5 minutes. No cooking required! 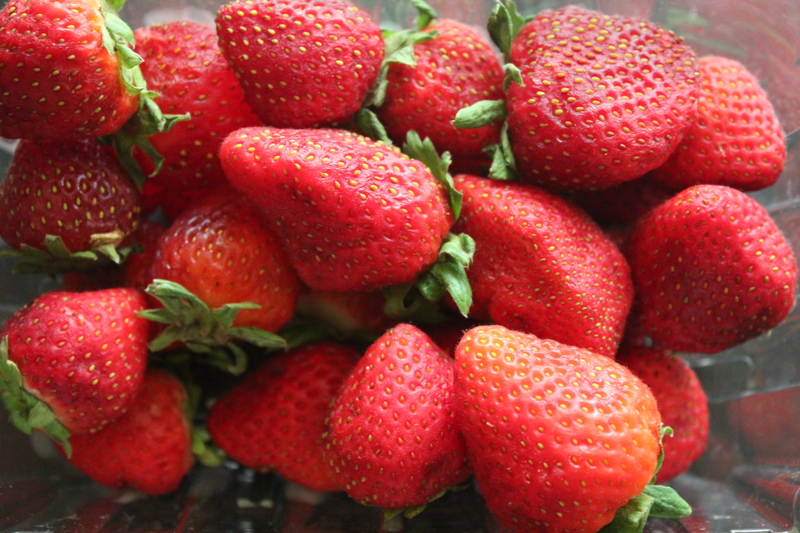 Combine strawberries and chia seeds in a food processor and blend until smooth (or desired consistency). 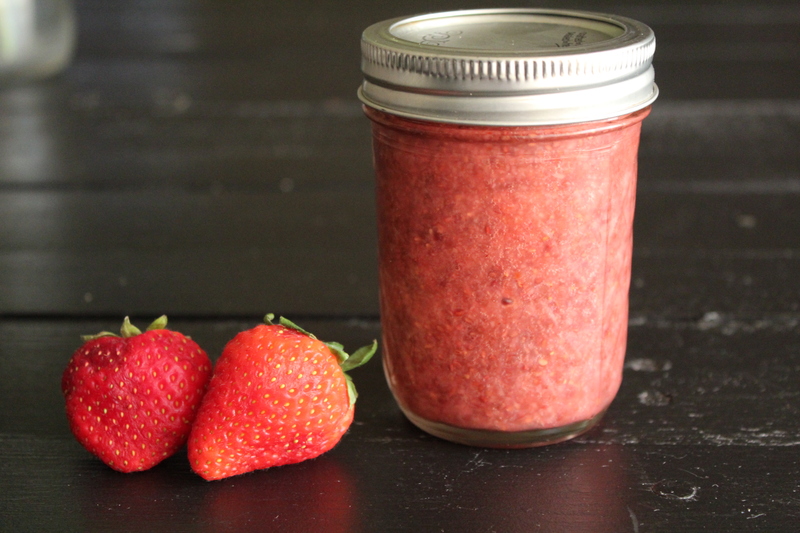 Store in jars in the fridge for 2 hours until jam thickens & slather it on all your favorite things. I don’t about you guys, but I’m a big fan of eating constantly…meaning I basically don’t leave the house without lots of snacks on me. These chocolate chip cookie dough balls are one of my go-to snacks when running out the door or for throwing in a backpack. Soak 1 cup of dates in warm water for 1/2 hour & 1 cup of cashews for at least an hour (but overnight is most ideal for easy blending). Drain the dates and the cashews & blend in a food processor until it forms a sticky, even consistency and holds together well. The mixture should start to form a big ball in your food processor when it is ready. 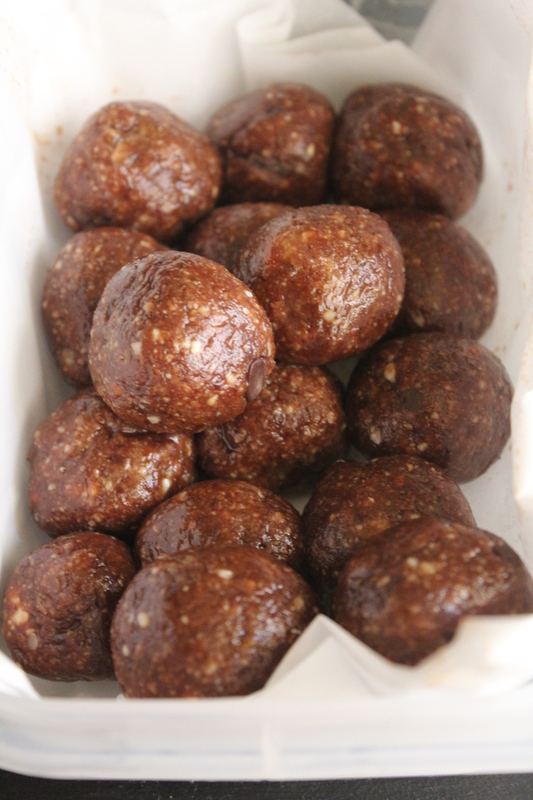 Stir in chocolate chips (optional, or you could add dried fruit, coconut, more nuts, really whatever you want) & roll into balls. Let refrigerate for an hour before eating or packing for best results! This salad is so decadent, I could seriously eat it every day. 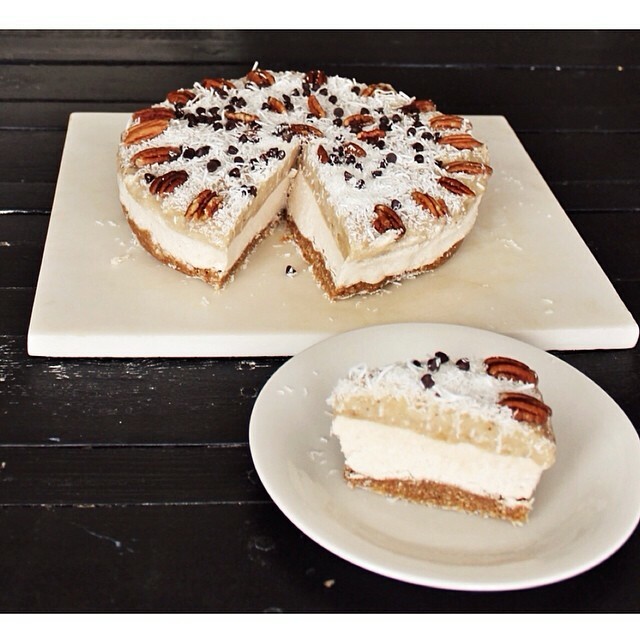 It’s hard to believe it’s totally vegan & gluten free. 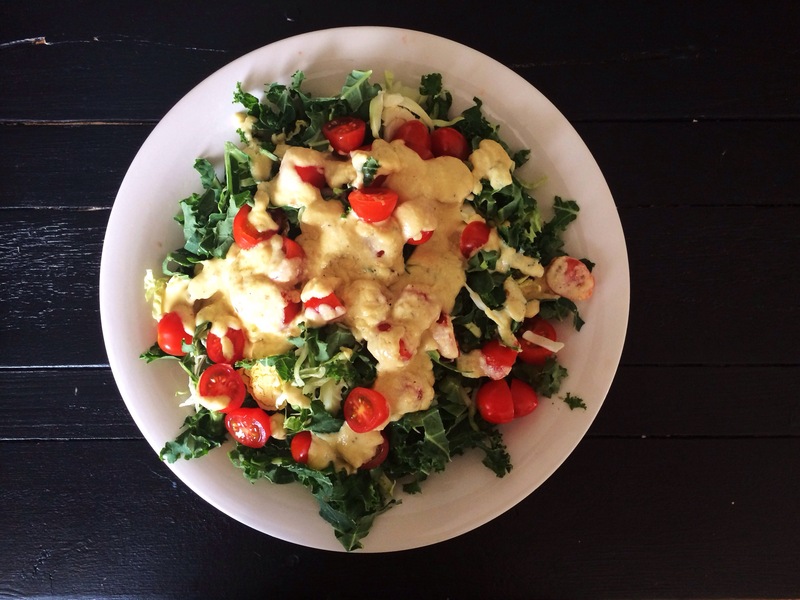 It’s almost like the salad equivalent to mac and cheese….that good. Add the above sauce ingredients to a saucepan, whisking constantly over low to medium heat. Make sure that it doesn’t boil, but rather melts and reduces. The sauce will become smooth, creamy, and thick. Remove from heat, immediately pouring piping hot sauce over bed of greens, allowing them to wilt a bit. Soak cashews & macadamia nuts for 2-4 hours (or overnight), then drain. Soak dates for 5-10 minutes and remove pits from center. Add walnuts, almonds, dates, and salt to food processor and pulse until well combined. Nut pieces should be well chopped and still crumbly, but easily able to form a malleable ball. Prepare the bottom of a springform pan (or cake pan, or glass dish, it doesn’t really matter) by sprinkling coconut on the bottom or greasing with coconut oil. Press nut and date mixture into prepared pan to form the “crust” layer. Pour creamy “cheesecake” layer into the pan evenly over the crust and smooth. Place the pan into the freezer for ~30-60 minutes to allow the layers to firm up. 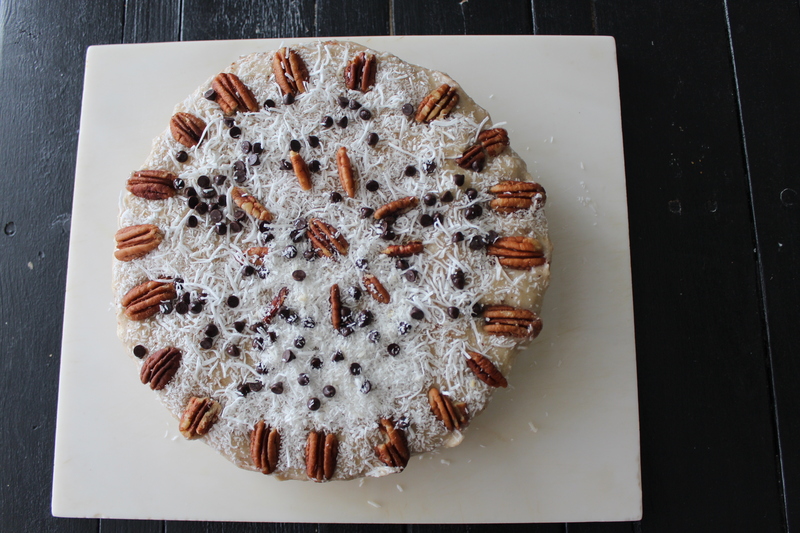 Decorate the top as you please with fresh fruit, nuts, shredded coconut, whipped coconut cream, etc…whatever you want, really. Place in the freezer for 2-5 hours, and remove 10-20 minutes before ready to serve (or don’t wait and eat it frozen, it’s really good too). 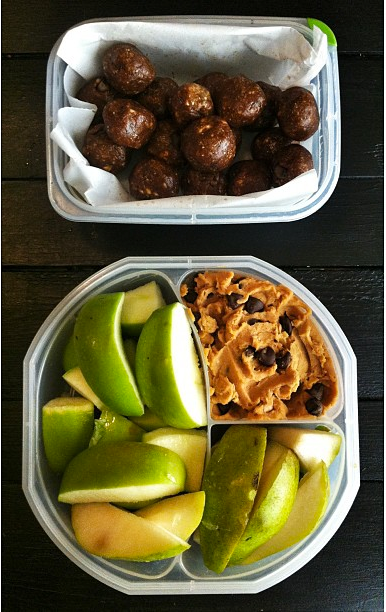 Leftovers can easily be stored in the freezer and make for an awesome snack. I couldn’t resist sharing my favorite cleaning tips because…you can actually eat almost all of the things I clean my house with (if you were for some reason inclined). Nearly all are food grade or literal grocery items and most all of the ingredients are incredibly inexpensive, nontoxic, and easy to obtain. After taking a few chemistry and food science classes, I started to get really suspicious about the chemicals I was putting into my body and the environment on a daily basis. I started taking a closer look at the foods I was eating, the products I was using on my body, and finally, the things I was cleaning my house with. They all just seemed so…volatile. And for what? Did these chemicals actually work better for me, the consumer, or were they just cheaper and easier for huge companies to produce? To top it all off, I am a college student on a limited budget. Do I really need to spend my money on hundreds of different products that each only serve one function? No…probably not. Many nutritionists and health experts will advise people to limit eating foods that have labels with chemicals and ingredients that we cannot pronounce, and I see no reason not to apply this to things we use on our bodies and in our homes as well. We buy all of these products with the hopes that they will leave our spaces sparkling clean and smelling fresh, but too many of these products are toxic if we touch or inhale them, and they are poisonous if ingested. I’m really just not about that, so I spent the next couple of years finding ways I could clean myself and my house in healthier way. Baking soda has the perfect amount of abrasion for scrubbing tough stains off of surfaces like counters, sinks, showers, toilets, etc. and has incredible odor fighting capabilities. It is also dirt cheap, usually at less than $1 per box. 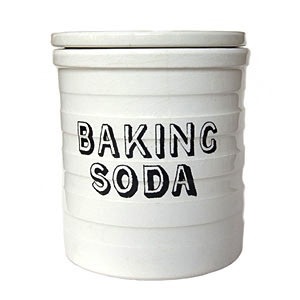 Baking soda is completely nontoxic, has no odor, and can be used for several homemade health and beauty products as well (which I will cover in another post). I like to keep my baking soda in a grated cheese/red pepper glass shaker for easy use, that way it can just be shaken out of the jar onto whatever surface I’m cleaning. White distilled vinegar is another cleaning essential, as it is effective at killing mold, mildew, and bacteria due to it’s high acidity. Though it is not officially registered as a disinfectant with the EPA, it has been proven effective to kill both Salmonella and E. coli. It is also effective at dissolving lime, soap scum, and kitchen grease, and is even gentle enough to use on wood floors. It can be used to clean floors, toilets, mirrors, glass, and basically every other hard surface. Again with the cheap, I think I pay less than $1 for a 2 gallon bottle at most grocery stores. Essential Oils are perfect for bringing fresh, clean, and healthy scents to your home and body products. When I first began my journey into natural cleaning, my biggest complaint was that the house just didn’t smell clean the same way it used to. Though this doesn’t bother me anymore and I’ve actually grown to love the simplicity, essential oils bring back the fragrance I was missing. A few drops of whatever scent (or scent combo) you like can be added to any of these recipes. Additionally, many of the oils have their own unique benefits and medicinal properties. Tea tree oil is one of my favorites for it’s antiviral, antifungal, antibacterial, and antiseptic properties, and I use it in almost all of my homemade cleaning products. Some other favorites are peppermint, lavender, grapefruit, lemongrass, eucalyptus, clove, and lemon. Though these are safe on the skin, I wouldn’t advise eating them unless the bottle explicitly states that it’s safe for internal use. Dr. Bronner’s Liquid Castile Soap is amazing, if you aren’t already hooked. Dr. Bronner’s is all-natural, organic, fair trade certified, and is all plant-based. I originally found this soap after years of struggling with horribly sensitive skin; still to this day this is the only soap sensitive enough for my skin. Both the bottle and liquid form are now readily available now at most supermarkets and health food stores and also online. It does not contain any harsh chemicals, detergents, or sulfates and can be used for literally everything from the body to cleaning (you can apparently even brush your teeth with the stuff). It’s also biodegradable and safe for the environment, making it the perfect soap to take camping. They come in tons of awesome scents, my favorite being peppermint, tea tree, lavender, citrus, and almond. Mix together 1/2 cup vinegar and 1/4 cup of baking soda with 1 liter of water and add to a clean, empty spray bottle. Add 10-20 drops of essential oil if you prefer a scented cleaning spray. This can be used in the bathroom to clean showers, sinks, and chrome fixtures as well as in the kitchen on countertops. It is safe to use on eating surfaces as well. A microfiber cloth or towel will also aid in the cleaning power, helping to trap and remove more dirt and grime. Add 15-20 drops of essential oil of choice to 1 cup baking soda and mix well. Sprinkle powder on carpets and let sit for 15 minutes before vacuuming well. The baking soda will help neutralize odors (including pet odors) and the essential oil leaves behind a nice, clean scent. I usually use grapefruit or lavender oil, but the essential oil can be omitted entirely if you prefer no scent. Create a “soft scrub” type cleaner with 1 tablespoon liquid Castile soap and 1/3 cup baking soda. Scrub until clean and rinse with water. Add 1/4 cup of baking soda and 1 cup of vinegar to the basin of the toilet boil and let sit for a few minutes. Scrub with a toilet brush and flush. 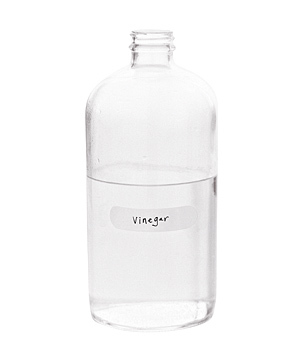 Put full strength vinegar or lemon juice in an empty spray bottle. Spray onto affected area and use a scrubby sponge to remove and kill mold and mildew. You can mop almost any type of floor by adding 1/4 cup of liquid Castile soap with 2 gallons of warm water. Add vinegar for extra cleaning power. Mix 1/2 cup vinegar with 2 cups water (or black tea for extra grease fighting power) in a spray bottle. Spritz windows and wipe with a sheet of newspaper or microfiber cloth until dry and shiny. Pour 1/2 cup of baking soda down drain. Next, add 1/2 cup of white vinegar and cover the drain. After 5 minutes, pour a kettle of boiling water down drain. The reaction between the vinegar and baking soda breaks down fatty acids which should help flush the clog down the drain. Place 1/2 cup white vinegar (or 1 lemon sliced in half) with 1/2 cup of water in a microwave-safe bowl and heat to a rolling boil, or roughly 3-5 minutes (depending on your microwave’s power). Remove the bowl and wipe the inside clean with a sponge or towel; caked on food and debris should now wipe off easily. You have essentially steam cleaned your microwave. Hey there, and welcome to my blog. I’m Dana, a holistic nutritionist and the owner of Nutrition by Intuition LLC, a functional nutrition private practice. I'm passionate about food, plants, & healthy living and created this website as a space to house and share some of my ideas. All of recipes I post support a whole-foods, plant-based diet & are packed full of healthy things like fruits & veggies. Most are naturally vegan and free of gluten, dairy, and meat.